​ Krishna appeared in Mathura, on the eighth day of waning moon (krishnapaksha, ashtamitithi) in the month of Shravana, as the eighth son of Vasudeva and Devaki. This day is celebrated as Sri Krishna Janmashtami. Many thousands of pilgrims will be visiting Sri Mayapur to have darshan of Sri Radha-Madhava and to partake in the midnight Maha abhisheka. The celebration is for 3 days, the adhivas on the day before Janmastami, Janmastami festival and Nandostava on the day after Janmastami. We invite everyone to participate in the celebrations and partake in the transcendental service to the Lord and receive His blessings. Your devotion and generosity has always made Janmashtami a very significant and jubilant event, touching the lives of thousands of pilgrims. On the day of Janmastami, Sri Radha-Madhava and Asta Sakhis will be offered two sets of new outfits and jewellery, gorgeous flower decorations and a bhoga of atleast 108 items and a big birthday cake. 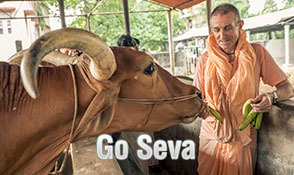 Book your seva right now and be fortunate to serve the Lord, His devotees and His dear cows in the holiest of dhams, Sri Mayapur. On the day of Janmastami the whole temple will be decorated with fragrant flowers. The Lord accepts the foodstuffs offered with love by a devotee. The remnant of the offering becomes prasadam or mercy of the Lord. On the day of Janmashtami, the bhoga consists of specially prepared plate of atleast 108 food items for the pleasure of the Lord. 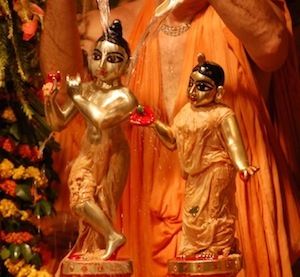 On the day of Janmastami, the Krishna Janma and Samskara Yajnas will be performed, including Samskara mantras for namakarana, annaprasana, vidyarambha, upanayana and other vedic rites are to be elaborately offered by the Mayapur Gurukula devotees. Thousands of pilgrims visiting Mayapur, over 400 resident brahmacaries and around 3500 community resident devotees honor together the anukalpa prasada on Janmastami and Nandostava feast. We are expecting at least 2000 free plates will be served to the visiting pilgrims. Of all the forms of charity, annadana is glorified as best and what more can be more spiritually rewarding than feeding the Lord’s devotees on His birthday! By pleasing the Lords dear most cows at the holy dham of Mayapur on His birthday, you will receive the unlimited mercy of the Sri Madhava. All our donors receive Sri Radha-Madhava Mahaprasada of dry fruits, Tulasi leaves and a picture of Sri Radha-Madhava darshan on Janmastami. 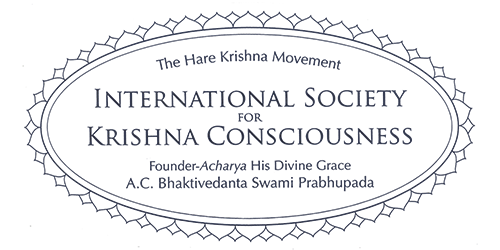 Once making your donation, kindly email us at mtd@pamho.net with your complete postal address, transaction details and any purpose or offering to be read to Sri Radha-Madhava. When making a bank transfer please send the details of the transfer to mtd@pamho.net.